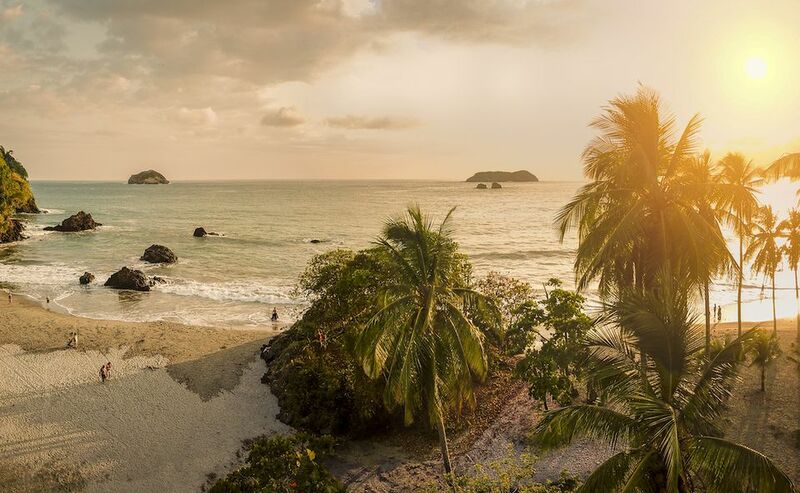 Best known for its pristine beaches, abundance of sunshine, and relaxing atmosphere, Costa Rica has a well-earned reputation for being a great destination for those looking for some quiet downtime. But, the country also offers plenty of unique opportunities for adventure too, giving travelers the chance to leave the plush resort life behind in favor of some adrenaline-inducing activities instead. These days it is possible to go ziplining just about anywhere in the world, as the activity has become incredibly popular in practically every corner of the globe. But Costa Rica is often credited as the birthplace for the adventure sport, which sends participants flying over scenic landscapes while harnessed to wire that is suspended high above the ground. The combination of speed and height makes for a thrilling experience that is tough to top. There are numerous places to go ziplining in Costa Rica, with the best options allowing daredevils to go flying above the canopy of the lush rainforest that makes up most of the interior of the country. 100% Aventura offers some of the best lines to ride during its canopy tour experience, with the longest stretching for more than 1.2 miles. White water rafting is one of the most exhilarating adventure sports in the world and Costa Rica has some amazing waterways for travelers to try. Whether you're looking for a leisurely paddle with occasional rapids to maneuver or you want a non-stop roller coaster ride along a raging river, you'll find plenty of opportunities there, including numerous destinations with Class I-III water that is particularly beginner friendly. In a country blessed with plenty of rivers to explore, the Pacuare is inarguably amongst the very best. In fact, it may be one of the top whitewater rivers in the world, which makes it a must-do for adventurous travelers visiting Costa Rica. A company called Rios Tropicales offers a one-day excursion down this famous river, which cuts through a spectacular wilderness filled with amazing plant and wildlife along the way. Surfing is a popular sport in Costa Rica and for good reason. There are a number of great locations on both the Atlantic and Pacific coasts that are considered to be amongst the very best in the world. Jaco is a prototypical surf destination, offering excellent opportunities for beginners and experts alike. More seasoned riders can head to nearby Playa Hermosa to get a taste of some of the best and most consistent waves in all of Central America. If you're looking to take up surfing, or simply just want to hone your existing skills, head to the Safari Surf School in the town of Nosara. This all-inclusive surfing camp will provide you with top-notch instructions and have you catching waves in no time at all. Climbing to the summit of a volcano is a popular adventure activity in Costa Rica, with several amazing hikes to be had. Probably the most popular of them all is Arenal Volcano in Arenal National Park. This volcano rises 5436 feet in height, providing some amazing views of the surrounding countryside, which is mostly made up of rainforests and coffee plantations. Because of its location and ease of accessibility, Arenal can get extremely crowded at times. For an exciting trek that is a bit more off the radar, try Turrialba Volcano instead. Located not far from San Jose, this peak is a bit trickier to get to, and as a result it is often overlooked by tourists. The trails aren't quite as well developed as some of the other options, but the rustic feel adds to the sense of adventure. This highly active volcano provides some spectacular views along the three-hour hike to the top, making it well worth a visit. Considering its location along two different oceans it probably isn't much of a surprise to learn that the scuba diving and snorkeling are top-notch in Costa Rica too. Just off the coast you'll find plenty of colorful tropical fish to spot, along with the occasional sea turtle, manta ray, and hammerhead shark. Cano Island Bio Reserve is arguably the best place to go diving and snorkeling in the entire country and there are a number of tour operators — such as Bahia Aventuras — that can help facilitate a day-trip to this outstanding location. The crystal-clear, deep-blue waters found just off shore are home to dolphins, stingrays, eels, tuna, barracuda, and numerous other species. On occasion, even whale sharks and humpbacks will swim by. From capuchin and squirrel monkeys to two- and three-toed sloths, there is always plenty to take in while visiting Costa Rica's rainforests. The country is home to a stunning array of wildlife, including numerous colorful bird species, large lizards, adorable tree frogs, and other exotic creatures too. A sharp-eyed traveler might even catch a glimpse of a jaguar, ocelot, or other big cat while wandering through the jungle as well. Corcovado National Park is one of the best places in the entire country to spot wildlife and Corcovado Expeditions offers options to go birdwatching or on a photographic safari inside the park. There is even an option to hiking in the rainforest itself as visitors go in search of the elusive poison dart frog. Spotting wildlife in the rainforest isn't the only way to take in Costa Rica's lush jungles. One of the best — and most tranquil — ways to explore the biodiversity of the cloud forest is to take a canopy tour, which uses a series of rope bridges and slacklines suspended in the trees to give visitors a bird's eye view of the surrounding landscapes. Many of the canopy tours found in Costa Rica include ziplines as part of the experience, but some — like the Monteverde Cloud Forest Reserve — forego the adrenaline rush in favor of a more laid-back, quiet approach. The result is a fantastic hike amongst the treetops that allows travelers to go at their own pace while stopping to spot exotic birds, monkeys and other local creatures. Whether you're an absolute beginner or a mountain biking pro, Costa Rica has plenty to offer. The country has some of the best single track trails in the world, including the Rincon de la Vieja, an 18-mile long route that runs down the side of an active volcano. Much of the riding takes place within the rainforest, allowing travelers to go at their own pace. While some will love the fast and flowy downhill, others will prefer to just roll along at a slower pace, soaking in the wildlife and scenery as they go. Mountain bike rental shops can be found throughout the country, making it easy to track down a bike that will grant you access to local trails. Many of those shops will also offer guided rides, although they can also provide plenty of intel for independent riders too. And when you're truly ready for an epic Costa Rican adventure, try taking on La Ruta de Los Conquistadores, a three-day mountain bike event that bills itself as the toughest race on the planet. La Ruta is not for the faint of heart, but it is definitely something you won't forget. For those looking to truly get out of their comfort zone, try adding canyoneering to your list of things to do. This emerging adventure activity involves rappelling into deep gorges and slot canyons, then exploring those areas on foot. In the rainforest that often means descending along waterfalls and into a dense tree canopy, which gives way to reveal a hidden world underneath. There are a number of companies throughout the country that offer canyoneering day tours. For example, Pure Trek offers a four-hour itinerary that takes travelers down four big rappels, with waterfalls, ziplines, and other activities, while tour operator Desafio provides a similar experience into a lost canyon that is begging to be explored. What is The Weather Like in Costa Rica During April?